Pope Benedict has rejected the idea of collective Jewish guilt for Jesus Christ's death, in a new book to be published next week. Tackling an issue that has led to centuries of persecution, the Pope argues there is no basis in scripture for the Jewish people to be blamed. The Catholic Church officially repudiated the idea in 1965. But Jewish groups say the Pope's detailed analysis of the gospels is a major step forward. "This is a personal repudiation of the theological underpinning of centuries of anti-Semitism," said Elan Steinberg, vice-president of the American Gathering of Holocaust Survivors and their Descendants. The Anti-Defamation League said it was an "important and historic moment". Excerpts of the book, Jesus of Nazareth-Part II, have been released in which the Pope considers the Gospels of John and Matthew and analyses the hours leading up to Jesus' death. How could the whole people have been present at this moment to clamour for Jesus' death? Benedict explains how only a few Temple leaders and a small group of supporters were primarily responsible for the crucifixion. He believes John's reference to "the Jews" must have been towards the "Temple aristocracy", because Jesus had declared himself King of the Jews and had violated Jewish law. In his analysis of the phrase taken from the gospel of Matthew - "His blood be on us and on our children" - Benedict says Jesus' blood "does not cry out for vengeance and punishment, it brings reconciliation. It is not poured out against anyone, it is poured out for many, for all." The Catholic Church's most authoritative teaching until now came in the 1965 document "Nostra Aetate" which said Jesus' death could not be attributed to the Jewish people either at the time or now. In a statement, the World Jewish Congress praised the Pope for setting an important marker against anti-Semitism and "unequivocally rejecting the argument that the Jewish people can be held responsible". 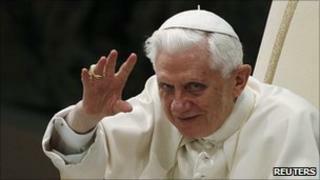 Pope Benedict has had an awkward relationship with the Jewish world at times. In 2007, he revived a prayer for the conversion of Jews, one of a number of texts struck out of the liturgy in the early 1960s that had been considered offensive to Jews. He has also been criticised for backing the beatification process of Pius XII, the wartime pope seen by many as keeping largely quiet about the murder of Jews in the Holocaust. However, he paid an unprecedented trip to Israel in 2009 and visited the Rome synagogue the following year.